Tangled Garden was an experiment in Kool-aid dyeing. How would the yarn feel after dyeing, would the colors be interesting and yet subtle enough to make a viable pattern? The pattern itself was inspired by a jacquard washcloth and my own tangled garden. Hints for knitters new to 2 colored knitting: try to be consistent about keeping the green in one hand and the purple in the other, keep the carries slightly loose. I find that a 12-inch circular needle makes 2-color knitting easier to handle. Above all, have fun with the whole process. Directions for Kool-Aid dyeing may be found here. With MC, CO 72 sts. Join in a ring being careful not to twist. Mark join as the beginning of the round. Divide sts over 4 needles. Work from chart until heel flap is reached. For a longer leg [the sample is about 8 inches], work a few more rows of the grape alone or repeat the motif from the top of the cuff. NOTE: Heel is worked back and forth on 36 sts. Row 1 [with MC]: Sl 1, *k1, sl 1 * repeat across from *, end k1. Row 2: Sl 1, p across. Row 3 [with CC]: Sl 1, *sl1, k1* repeat across from * end k1. Row 4: Sl 1, p across. Repeat these 4 rows, alternating colors every other row until you reach 2.5 to 3 inches or your desired length. End with a p row and MC. MC is used throughout the turn. Row 1: Sl 1, k19 sts, k2 tog, k1, turn. Row 2: Sl 1, p5 sts, p2 tog, p1, turn. Row 3: Sl 1, k6, k2 tog, k1, turn. Row 4: Sl 1, p7, p2 tog, p1, turn. Repeat Rows 3 and 4, adding 1 k or p stitch after the first slipped stitch until all side stitches are consumed, ending with a p row. Beginning with needle 1 and MC, work across heel flap. Pick up and k the slipped sts from the side of the heel flap and k1 st in the gusset corner. K across instep -- needles 2 and 3. With needle 4, pick up and k1 st in the gusset corner and then pick up and k the slipped sts from the side of the heel flap. Needle 1: Work sole pattern according to chart to the last 3 stitches, k2 tog, k1. Needle 2 and 3: Work instep pattern according to chart. Needle 4: K1, SSK, work sole pattern from chart to end . Work even according to chart. Repeat these 2 rounds until stitch count returns to 72, incorporating the gusset decreases into the sole pattern. Continue working from the chart until foot measures 1.5 inches from the end of your longest toe. Rnd 2 and all even rounds: Knit around. Repeat these two rounds until there are 6 sts remaining. Cut yarn leaving 12-inch tail. With a darning needle thread yarn through remaining sts and pull snug. 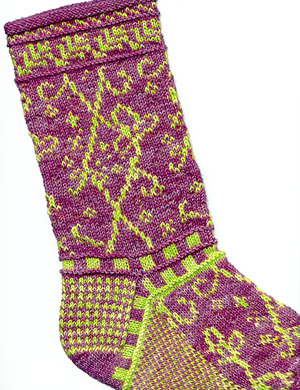 "The Sole Solution" software by Mary Moran was used in the making of this pattern. Robyn Gallimore launched RedBirdKnits.com in 2000 because she was unable to find the sock yarns that people were raving about on the internet. Along came designing and a huge leap and a big yelp on the sale of her first sock pattern. Socks are her favourite things to knit and to design but since it gets rather cold here in the winter and too darn hot in the summer, plans are afoot to branch out into other garments -- always knit in the round and with lots of color and/or texture. Her first knitting project was a doll blanket of Canadiana wool that ran terribly and died a merciful death a few years ago. Early commercial knitting successes included sweaters for 3 of her teachers in public school which netted $20 and a really ugly necklace. Robyn has 2 great children, a dog, 4 cats and 2 unused degrees. When she isn't knitting, she gardens or plays the cello. © 2002 Robyn Gallimore/Red Bird Knits. Contact Robyn.